Following the success of his first album in over a decade, the acclaimed The Man I Want to Be, Engelbert Humperdinck brings yuletide gladness to families everywhere. 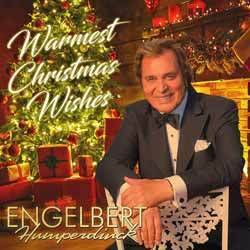 Much like its predecessor, 1980’s A Merry Christmas With Engelbert Humperdinck, Warmest Christmas Wishes is a combination of classic, new and unexpected songs. Traditional holiday songs like ‘Silent Night’ and ‘O Tannenbaum’ sit next to festive standards like ‘Please Come Home for Christmas’ and ‘White Christmas’. Fans can expect to hear the latter reinvented in a Django Reinhardt-inspired swing arrangement. Engelbert delivers Christmas cheer with contemporary tunes such as Chris Rea’s ‘Driving Home for Christmas’ and Gilbert O’Sullivan’s ‘Christmas Song’. Two new original songs – ‘Christmas for the Family’ and ‘Around the Christmas Tree’ are bound to become instant holiday favourites. If you think this is solely an album that grandma will enjoy then you'd be wrong. Well, yes, I'm sure grandma will love it, but this is a festive album that the entire family can enjoy. Not content to just deliver an album of carols and classic festive pop songs, Humperdinck delivers an album full of songs that you know, but with a new twist on each. I was particularly impressed with his take on 'What Are You Doing New Year's Eve?' other highlights include 'Christmas Song (I'm Not Dreaming of a White Christmas)'; and 'Silent Night'. Buy this and it's guaranteed to become required listening every Christmas. A beautifully produced and wonderfully presented album. 13. What Are You Doing New Year's Eve?